Objectives and Key Results (OKR) is a popular management strategy for goal setting within organizations. The purpose of OKRs are to connect company, team, and personal goals to measurable results while having all team members and leaders work together in one, unified direction. OKRs are typically implemented within specialized OKR software. A large part of OKRs is making sure everyone knows what’s expected of them at work. OKRs are supposed to be public so that everyone moves towards the same goals and are aware of what others are working on. OKRs consist of a list of 3-5 high level Objectives. Under each Objective there should be 3-5 measurable Key Results. Each Key Result can be measured on a score of 0-100% or 0 to 1.0. See the example OKRs special site for some examples on how OKRs look in the wild. OKRs are typically part of the quarterly planning process. While the majority of OKR usage is quarterly, some companies will also set annual or monthly OKRs. It's said, that if there is one team management practice every leader should implement, it’s OKRs. It's lightweight and does not consume too much time or resources to run. OKRs give the strong benefits of productivity, focus, and company culture. Originally implemented in the 1970s by Intel President Andy Grove, OKRs spread across many companies, especially when they were introduced to Google by John Doerr. Now, OKRs are used by tens of thousands of companies from SMEs to the Fortune 500. Google, LinkedIn, Intel, Zynga, Sears, Oracle and Twitter are just some well-known OKR users who love and use them. 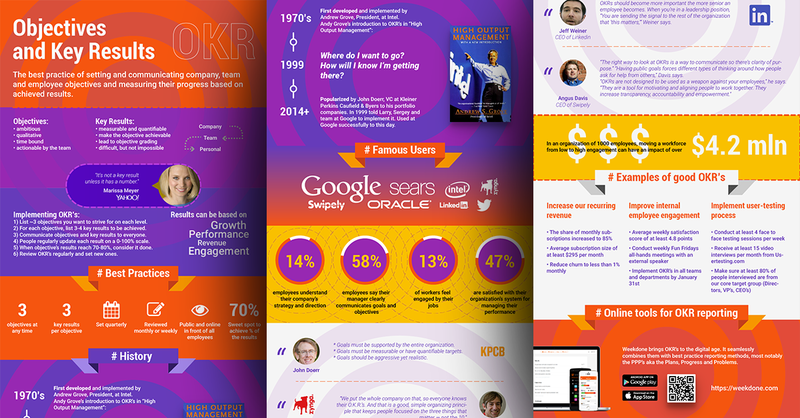 See this infographic for more about OKR history, users, quotes, best practices, and examples. To implement Objectives and Key Results, use an online OKR software tool like Weekdone. Once defined, communicate your Objectives and Key Results to everyone. If needed, tune the wording together so everyone has a common understanding. As people start working, they will update their result indicators regularly - preferably weekly. An objective is considered done when 70-75% of its results have been achieved. If 100% of objectives results get done, it may not be ambitious enough. Review OKRs regularly, as needed. Be flexible. If your company, team, or personal goals change, feel free to change the OKRs as well. No process should be more important than common sense and everyday business. See here how OKRs can be implemented in minutes in the leading OKR software. 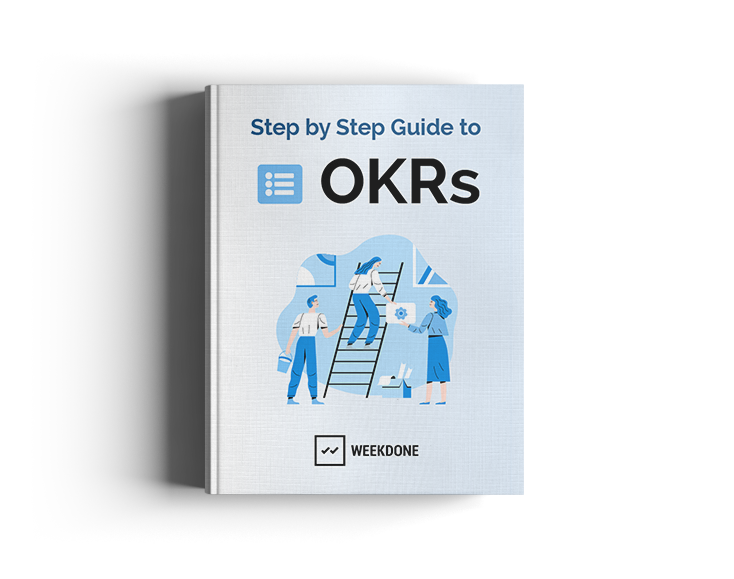 When set up and used regularly, OKRs are simple to use and do not take much time to implement. Often, it takes just a few hours each quarter to check and review your OKRs, although you should check them a little more regularly to keep up with progress and mark said progress on a weekly basis. Learn how other companies use OKRs to improve their teams by reading these OKR case studies. 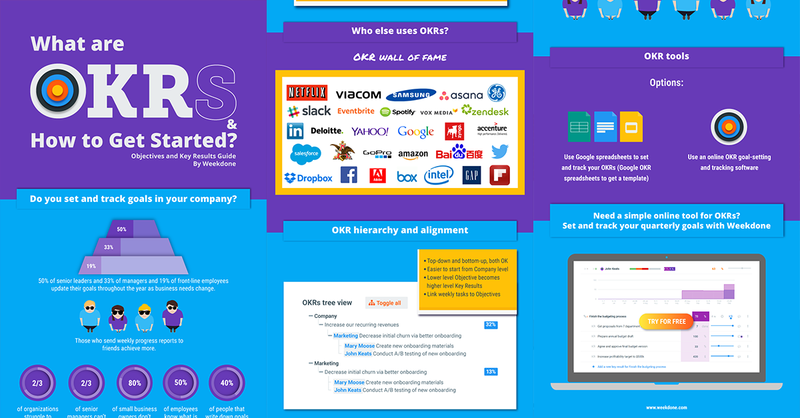 Need an OKR tool? Try Weekdone, the world-leading OKR software for free. Company, team and personal OKRs - it's all there in a beautiful visual way. The visual OKR dashboards quickly show you how your company is doing. Try out OKRs using Weekdone Free trial Always free for small teams. 15-day free trial for others. No credit card required.